The birds who flutter out front. Catching the wind they soar so high. I long to be one with the sky. I’d live or die by the weather. Than outside freezing my feathers. Looking over an overgrown path or a straight, simple way. As she peers down each path choosing what to do. She glances behind her and tosses a saucy smile. When did she become his life, someone for whom he’d easily die? As long as I can go with you on life’s endless quest. Be my partner and my friend, my confidant and mate. 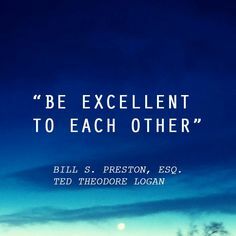 My 10 y/o and her dad sat down to Watch “Bill and Ted’s Excellent Adventure” this afternoon, (a film so old, according to the 10 y/o that when I told her when it was made, she wondered why it was in color and not in black and white).and I was reminded of some most excellent advice given by Bill S. Preston, Esq. and Ted Theodore Logan. It is so easy to be cruel, to be callous and unfeeling, to put personal interests above the need for compassion and acceptance. Bill and Ted, while not the two brightest teenagers depicted in film, understood the simplest of lessons: be kind to others. Simple but profound. 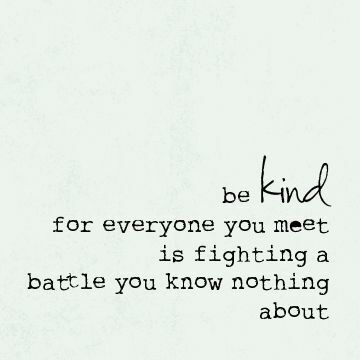 How much better our world would be if we all practiced being a little kinder each day. How does that old saying go? You’re never too old to teach an old dog new tricks? Well, you’re never too old to learn something new, whether that’s a hobby you’ve longed to try, a skill you’ve seen others do or the desire to return to school and try a new career. It’s scary to be a neophyte, to start over at the bottom, but how exciting to discover a new passion or a new path. I’ve returned to school to earn my bilingual license, and it’s been awhile since I’ve been a student in a classroom. Everyone else in class has been younger, has more current knowledge of the subject and is either a native Spanish speaker or very close. I was intimidated at first before I remembered I have almost a decade and a half on the job of teaching bilingual education to students, and while I might not have the piece of paper proving such, I am not an empty vessel to be filled. To be certain, there is much for me to learn, yet there is much I can share, too. So if you’re contemplating a new career, skill or hobby but are hesitating because you are reluctant to start at the bottom remember this. There is always something new to learn and there is always much we can teach. Thank you to the Green Dog Chronicles for nominating me for the 3-Day Quote Challenge. A message of kindness and acceptance, of compassion, and one of caution. Too often we take information we are given as irrefutable proof without delving deeper to find the truth. Our fast paced society, instant gratification entertainment and social media deities have turned many into abridged versions of their best selves. We don’t stop to listen or to think. We don’t formulate responses to avoid unnecessary cruelty or the unfortunate spread of misinformation. What is important is not surface distractions but deep, meaningful conversations with others, connections formed through time and the never-ending search for truth. A post I wrote last year has a similar theme. It’s called Hidden Beauty. A sculpture’s worth lies not in the sleek elegance of simple lines, of a life formed from inert clay, but in the time spent chipping away at an imperfect facade to uncover the naked truth within. For in patient toil, there is the breath of life. Breathe deep, my friends, slow down and find the essential beauty and truth in your lives today.